Tied in Pink consists of 15 romantic stories from 14 different authors around the world. Some of the writers have many book titles to their name, others are emerging or debut authors. The stories range from classic romance, to fantasy, Sci-Fi, thriller or family mystery. Some are sweet, some heart-warming or inspiring while others are more risque and edgy. 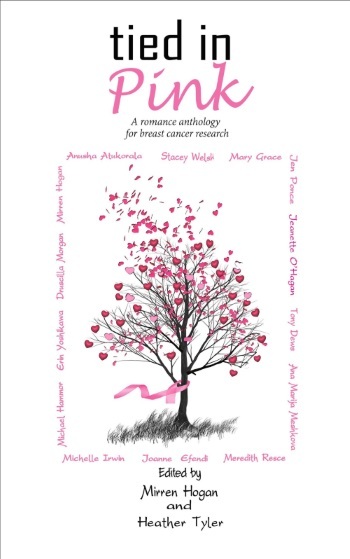 All the stories are written from the heart and include a reference to a pink ribbon to honor those who are (or have been) affected by breast cancer. In my story, The Herbalist’s Daughter, Anna has given up hoping that the sturdy young guard will notice her, that is until the mischievous young prince Naetok begins to stir things up at the Palace. The story takes up the adventures of Anna, Rokkan and Naetok introduced in Fever. I would love you to read it – and would be grateful for fair and honest reviews on Amazons, Good Reads, or Book Likes. If you would like to keep update with latest releases, publication and news, please sign up to my newsletter.